View-through attribution, or VTA for short, enables mobile advertisers to track impressions as well as clicks, and attribute installs to specific impressions. Here we’ll present a real world example of how enabling mobile VTA can be advantageous to scale campaigns, while dispelling a few commonly held misconceptions about VTA. Without VTA, advertisers are potentially blacklisting “good” channels because they are missing out on measuring the complete ROI picture that only a combination of VTA and CTA can provide. Advertisers can’t measure the attribution lift that occurs from users that view their ads, providing a misleading view of publishers and variable effects. Herein lies a common error which is that advertisers might be dismissing channels that may not show results based on the limited measurement system of last-click tracking. Inaccurate decisions, decreased channel efficiency, and less impactful campaigns are only a few of the dangers in a world without VTA. What are some common misbeliefs about VTA and what do these graphs really show? This graph showcases a VTA client test. The results of the test showcase attribution graphs that are are very tight and nearing perfection and, for VTA subset, the results showed that it looked healthy. Find your VTA lookback window. We are always performing analysis to fine tune VTA strategies for our clients, and we want advertisers to benefit from the fruits of our labor. Based on our experimentation, we’ve found that using the same VTA lookback window across each partner is required. As a user may be connected to all these channels, having one lookback that is longer or shorter than another can generate misleading attribution and non-optimal budget allocation. Finding the right time lookback window for your title is key. For some advertisers, VTA helps showcase that native is not the best solution. As illustrated above, native impression graphs look weak. We would recommend this advertiser hold off on native impression pixels for now until we dug into the “why” to see if there are publishers or countries where native performs or if it is universally not good for that advertiser or campaign. In many cases, we found there was a very similar pattern on time-to-install across VTA and CTA, indicating that these were indeed healthy. On the other side, the native impression graphs look weak. 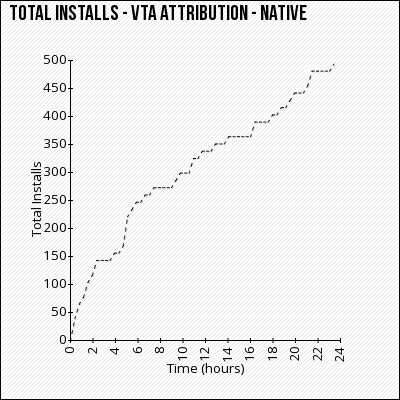 When comparing the time-to-install (TTI) patterns of users installing via view-through (impression) attribution and native graphs, VTA can help an advertiser reach a logical conclusion that discontinuing native is an advantageous action to scale campaigns. Enabling VTA helps campaigns scale vs. click-through alone. After conducting analysis on VTA time-to-install, we found that there was a very similar pattern on time-to-install across VTA and CTA, indicating that these were indeed users we were driving. View-through attribution goes one step further than click-through as it ties conversion events back to individual impressions. This means advertisers have a better understanding of the real number of users they are driving and their motivations. Accountability - you know what happens with each dollar you spend and where to allocate your budget. When breaking out click attribution and banner impression attribution, it’s clear that the graphs are very similar. This showcases that the advertiser is omitting a substantial amount of good quality traffic by having Banner VTA turned off. 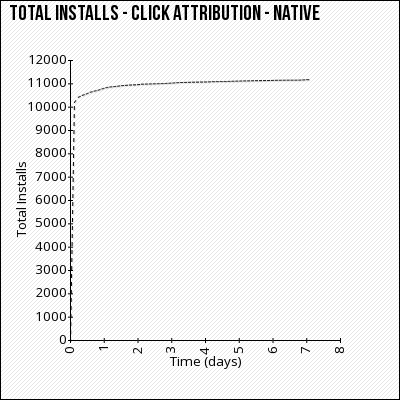 These graphs present a convincing case to enable view-through attribution on your campaigns. Enabling VTA provides insights based on the value of impressions and a more robust story about users which can shape advertisers’ decisions. Otherwise, advertisers are giving up high quality traffic by having VTA turned off. If you are an advertiser that wants a more efficient allocation of your marketing budget, reach out to us to test VTA. If you have more questions about enabling VTA or are ready to put it in action, reach out to your CrossInstall Account Manager (current clients) or send us a message.